Officials retaliated by transferring striking prisoners to different tiers and other prisons, hoping to defeat their solidarity and depriving them of outside contact. Loved ones have to wait several weeks before they are allowed to visit a prisoner at a new facility. Officials issued rules violation reports for “causing mass disturbance” or for outside communication—though a hunger strike is clearly not a “disturbance” in the sense of a fight or a riot, and communicating with outside is still legal. 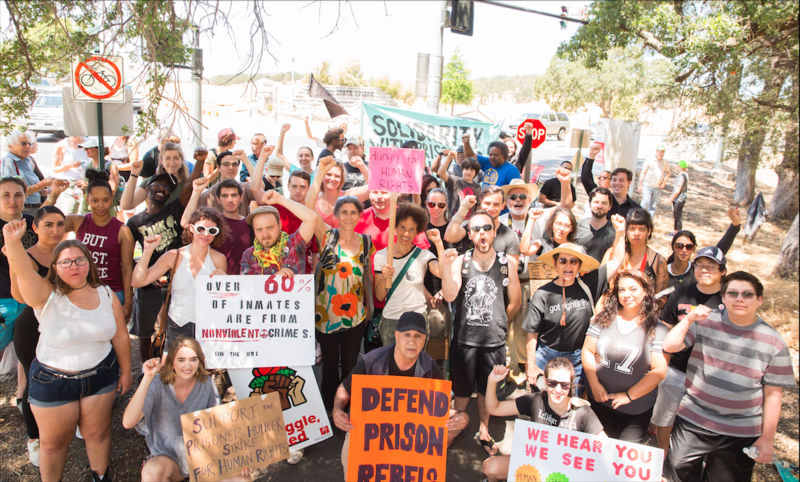 On June 4 about 100 people demonstrated in front of Folsom prison in a show of support for prisoners’ humanity. Others demonstrated in Los Angeles at the same time. A former SHU prisoner speaking at Folsom’s gate expressed his admiration for those inside, since there is very little history of prisoners winning anything from prison administrations. Prisoners’ victories depend on outside support. A lawyer, who worked with the prisoners who staged the historic hunger strikes against indefinite solitary confinement in 2011-13, recalled that those prisoners risked their lives, not for themselves but to ensure that what happened to them would not keep happening to younger prisoners. She pointed to just how remarkable the “Agreement to End Hostilities” is, identifying the system, not each other, as the enemy. As a result of the settlement of a suit from that hunger strike, CDCr released many prisoners from the SHU, and now those officials who hate the legal settlement are putting people in ad-seg indefinitely. Conditions in ad-seg are worse in many instances than SHU. They were meant as very temporary housing, and prisoners there are not allowed any of their property or papers. You have nothing but the four walls closing in on you. A psychiatrist who used to work at Pelican Bay Prison spoke. She had resigned because she saw that, even after 22 years of court oversight, CDC couldn’t be changed from the inside. Prison only exacerbates mental illness—solitary is torture! There are only two psychologists at Pelican Bay for the 25% of prisoners with mental illness. This entry was posted in Articles and tagged Agreement to End Hostilities, Allegra Pinell, Folsom State Prison, Hugo Pinell, Pelican Bay hunger strike, Pelican Bay Prison, prisoners, Security Housing Units, Urszula Wislanka. Bookmark the permalink. A swift salute to all of the supporters and those concerned with the ongoing fight to reform CDCRs ASUs. On May 28, 2017, I was “special” transferred under a warden to warden agreement to D.V.I.s ASU. This was done as a retaliation for alerting the public of the conditions of confinement at FSP, as well as other ASUs. I was not the only person transferred, prisoner R. Delossantos F-486401 was transferred to Vacaville CMF, merely for exercising the 602 process. As of date the Hunger Strike process has been suspended until further notice. It is unfortunate that we as prisoners must use this process in order to shine light on CDCR’s unwillingness to oversee its ASU conditions. CDCR allowed FSP administration to retaliate, isolate and condone the poor conditions of ASU. I was transferred to even more extreme conditions where there exists roaches, rodents, no drinkable tap water and sanitary conditions are that of a third world country. The fight can always continue with the outside support keeping pressure on CDCR’s top officials and administration to change the property matrix for ASU to expand “administrative SHU” to cover long-term confinement, to implement educational opportunities, rehabilitation programs, sanitary conditions, pull-up bars in ALL cages, and force all prisons with ASU prisoners to install outlets for use of electronic appliances such as TVs, radios and typewriters. The ASUs are now CDCR’s new SHU without privileges and incentives under the guise of short-term detention as discipline. This is far from the truth. This fight affects everyone now and those who eventually come into an ASU. It doesn’t matter what group you may run with or circumstances for ASU placement, this is what it is, back to toothpaste in jelly packets, drinking out milk cartons, clothes all tore up, freezing during the winter. ASUs are limited to housing now that the Coleman case created STRHs (short term restricted housing), we’re back to square one. So I encourage prisoners and supporters alike with voices louder than mine, to look into this, assist me by 602ing conditions in your ASUs, for those going out on mainlines look into conditions in their facilities ASU. I will continue fighting administration, now through the courts and hope for relief. Any assistance, guidance or moral support from those aware or educated would be sincerely appreciated. Thank you all outside supporters who held rallies and lent their voices for change, I will not let your support go to waste. ← Discussion article: The French presidential election: ‘En Marche,’ indeed! Toward what?